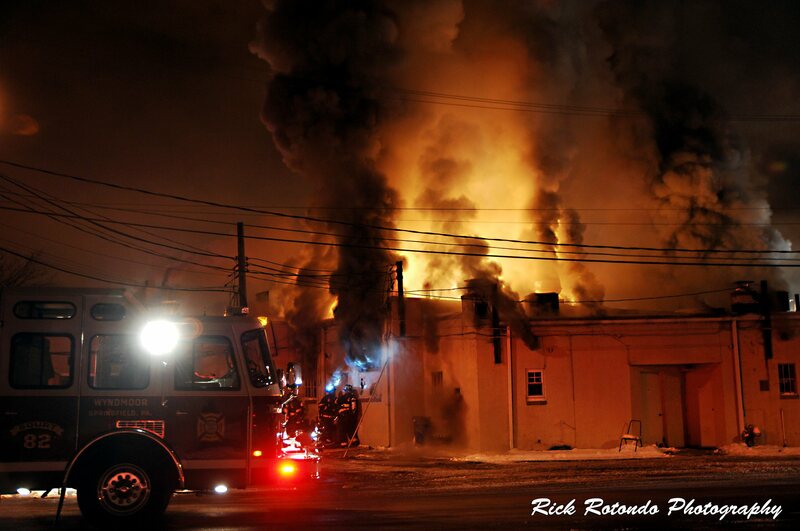 At 22:22 hours on 1/4/14 Montgomery County Department of Public Safety dispatched crew from Stations 6, 700, 82 to Flourtown Plaza Shopping Center, at the corner of Bethlehem Pike and East Mill Road for a report of smoke for the building, Springfield Township Police (28PD) arrived on scene with smoke showing from a single story stripmall of six stores, Chief 6 arrived and reported heavy smoke and fire smoke showing from the roof line, Eng 6 arrived side A and deployed hand lines, Chief 6 established command and reported fire through the roof and ordered the 2nd alarm to be struck, fire companies on scene were Stations 6, 700, 82, 29, 45, 7, 88, 400, and EMS 311 & 318, Crews were also assisted by 28 & 32 Police departments & Springfield Public Works for icy road and parking lot areas. The deep-seated fire was contained to Flourtown Pizza Restaurant, and the evacuation order was requested to go into a defensive fire stance, with master streams and aerial streams put into service to protect other exposures which suffered water and smoke damage on either side of the pizza shop. Flourtown would like to thank its fellow township companies and surrounding area companies for their assistance with this fire, no injuries were reported and crews were on-scene until 01:30 hours 1/5/14. Below is a compilation of some of the photos and videos collected from various observers and companies involved. The videos and photos are shared here remain the property of those submitting them and no rights are implied. We thank you for sharing them with our volunteers. The Colonial Regional Technical Rescue Task Force, of which Flourtown Fire Company is a participating member, held a Department of Homeland Security authorized drill on Sunday, November 20, 2011. Taking advantage of the unseasonably warm weather, the companies gathered at Spring Mill Fire Company and were soon dispatched in an order as they would be in a real emergency to a local train crossing and station. 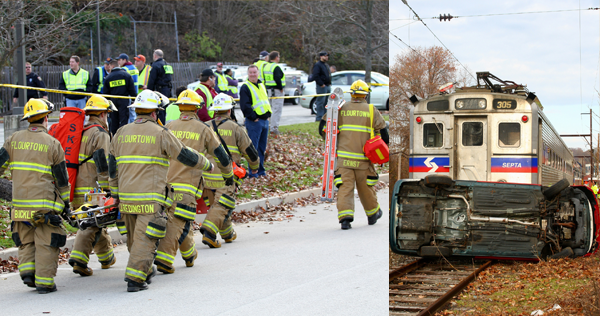 The scenario involved a commuter train striking a vehicle, and a mass causality and injured situation. There was also a separate law enforcement element that involved a terrorist bomb scenario, but that was held on a separate car a bit further down the tracks from the fire companies’ drill. Flourtown personnel, Assistant Chief Chris Buckley, Captain Chris Manning, Leitenant John Redington,and firefighters: Dean Seltzer, Kevin Davis, Tim Ernst, Tyler Buckley, and Sal Santangelo all took part in stabilizing victims and extricating them from the train and the severely-damaged vehicle. Chief George Wilmot and his daughter, Lexi Wilmot were part of the scenario’s observation team and “victim” volunteers. Photos by Bob Wilmot, Jr.